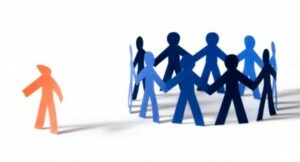 Home » Communication » Is Discrimination Undermining Your Project? [Ellen] Pao has also raised an incident in which one of the firm’s senior partners, former Hewlett-Packard Chairman Ray Lane, asked her and another female colleague to take notes at a partners meeting. “I just froze, I wasn’t sure what to do,” Pao testified on the stand. Sandberg talks about the disturbing tendency of managers to assign the “office housework” to women. “These activities don’t just use valuable time; they also cause women to miss opportunities,” she wrote in another New York Times op-ed. Valley of the Boys, Bloomberg Businessweek, Mar 23, 2015. I had waited in line for about five minutes, with people in front of me and behind me. When I got to the desk I asked for a room in the motel. The lady glanced up at me and said “we don’t have any vacancies.” She then looked past me to the next person and said “may I help you” and he stepped up and said “I need a room” and the lady behind the desk gave him a sheet to fill out and went about getting him a room. I needed some spray paint and put my purchase onto the counter. The gal picked up the paint can looked at me and said “we can’t sell this to you.” I was getting smarter, so I just went back and got another can of paint and got into another line. A guy sold me the paint without an issue. I was walking back to where I lived. The parking lot I was cutting across late at night was occupied by about a half dozen cars in a wide circle where a bunch of guys were talking to each other. The shortest route was through the cars and so I took it without much thought. As I walked out of the circle of cars, one of the guys said to me “you’re pretty brave for a white boy.” I looked back at him as he said that and noticed that everyone in the group was black. We were in a slow time between projects. I usually tried to take care of all the little maintenance things during these times. One woman who worked for me asked me what she could do. I said it would help if she helped to clean up the office …. She gave me a look that bordered on outrage. I didn’t get it at the time. The humorous part is that it was what I was doing, cleaning out files and digging through all the piles of things to reduce the clutter for when we were really busy again. This was my first hint that people were overly sensitive to some things based on historical discrimination, and I was unaware of them. I was in the Air Force and we were comparing war stories and how we often had to keep a low profile in some countries. I mentioned being in the Philippines and how it was tough to not stand out because I was tall with pale skin. I mentioned that the Filipinos were generally shorter and had fairly dark skin but not as dark as, and I pointed to one of the folks in our group who was black. Within a day my immediate commander found me and told me he had received a complaint that I had made a racist comment. I responded to the complaint by making an appointment with my boss’s boss, who was an Afro-American Air Force Colonel, to try to understand what I had done wrong. The Colonel said nothing except “yes, it is a challenge” and dismissed me. In the It Might Just Be You I mention how I found a senior manager crying at her desk. I had a meeting with her but when I got there she was clearly upset. She confided with me that she felt this organization was sexist and treated her unfairly. The most recent behavior was when the director of the institute asked her to show a VIP around the facilities. She recounted many of the other little slights she had received, but from hearing them I found myself startled and thinking “She’s just not part of the inner circle! I’ve experienced this all my life ….” This is when I realized that it might be very hard to distinguish between normal “I don’t care to be friends with you” and classic discrimination. I had recommended a manager who worked for me to have her department expanded and some functions moved over to her as part of my reorganization after taking over the directorate. I also noted that her salary was noticeably lower than my other managers, who were all male, and so along with my proposal I included a salary boost to put her on par with her peers. My boss, the general manager of the organization, agreed with everything except the salary boost. He wanted a much smaller salary bump for the additional responsibilities she picked up. When I asked him why, he just said the salary I proposed was too much. I told him that his reason wouldn’t sound convincing in a discrimination lawsuit. I also have to add that this woman was my best manager. She was not the most technically competent, and we were a high tech company, but she was the only one of my departments that still made money and I wanted to use her approaches in my other departments. The bottom line was the general manager told me to move the functions being discussed to someone else’s department or form a new department instead. I ended up forming a new department and promoting a new manager, who was male, who negotiated successfully with my bosses for a bigger salary bump and to a bigger salary than even I had proposed. The trick I’ve found for all these kind of dynamics is to pay attention, especially to the person or persons exhibiting the behavior or reacting to a behavior. My conclusion I reached was that a lot of discrimination was very subtle and very easy to mix up with other more socially acceptable tribal behaviors (e.g., you’re a geek, so I don’t want to hang with you, you’re too skinny so I don’t want to go out with you). My other conclusion was that one had to be a saint or Zen enlightened to sort out the difference. The best things I’ve seen, being a data driven person, is when statistical distributions shows that one group is clearly getting different results from another when there is no obvious reason why (e.g., salaries, hiring, promotions, awards, leadership positions, etc.). These are things we can fix. However, even doing these things doesn’t mean we don’t have to be sensitive to saying and doing things that look too much like historical discrimination. In my case it took me a bit too long before I figured out that suggesting someone “help clean up the office” or referring to someone’s darker skin could be considered insulting or discriminatory. What are you doing to ensure that discrimination is not impacting the performance or motivation of your project team?